On Sunday, October 30, 2011 the﻿﻿ Town of Colto﻿﻿n unveiled a new historic marker at Sunday Rock Park along State Highway 56 in the hamlet of South Colton. 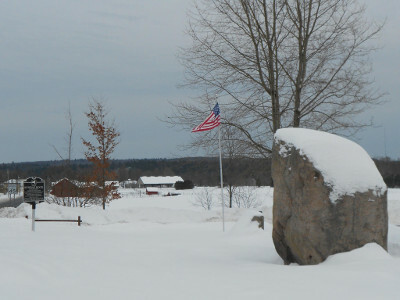 The marker lets travelers know that Sunday Rock, a multi-ton glacial boulder, is now on both the State and national Registers of Historic Places. Over 60 people attended the event led by past Town Supervisor Lawrence Patzwald. Sally Thomas has taken the initiative over many years to preserve and recognize Sunday Rock as an Adirondack landmark and legend. "South Colton. The hills begin here. So do the woods, the great South Woods, the Adirondacks. The Town of Colton straddles the northern boundary of the Adirondack Forest Preserve. One end of the town touches on the neat homes of St. Lawrence County; the other reaches into the woods. In the middle is Sunday Rock. Previous to settlement in this area, the Indian trail into the mountains ran by here. In that long ago time, this 64,000-pound glacial boulder was used as a landmark by the Indians, and when the white settlers came, they used it for the same purpose. The rock was a natural landmark, and travelers were guided by the big rock in the middle of the road. The rock separated the woods from the world. There was no law for deer nor trout, and all the woods was one grand hunting ground. In those days, it was said that beyond the rock there was no Sunday. Camp life went on from day to day with no change. It was all one glorious holiday when Tuesday might just as well have been Saturday, and Thursday and Wednesday could change places. Friday might have begun the week for all anyone knew or cared. The rivers, the brooks, the ponds, the mountains and the trees, the fleet deer, the rushing trout, the wildcat and black bear ruled supreme. It was their land and there was no Sunday. The road past the rock also served as the way in for scores of loggers and for them, here the rough and tumble fellowship of winter camp began. Thus, the big rock began to be called Sunday Rock. By whom, nobody knows, but the reason is evident. After a while, the rock came to stand for something else. When people from the valley passed it on their way to the mountains, they felt a sense of arrival, of having crossed a dividing line. On the other side of the rock were the woods and mountains, life was freer and easier. Saluting the rock became a kind of joyful ritual to be observed. Elders might uncork a bottle and children could cut up without fear of a scolding. Hunter and fisherman had the feeling of eager anticipation as the cares of everyday life were left behind. In 1925, when the automobile became the popular way to travel and this Highway 56 was to be built, the rock lay directly in its path. Old friends, headed by Doctor C.H. Leete of Potsdam, came to the rescue. The Sunday Rock Association was formed with 210 members from seven states, the District of Columbia, the Canal Zone and Canada, giving a total of $260. For this amount, the rock was moved, and a booklet entitled "Sunday Rock, Its History And The Story Of Its Preservation" was published. 'Who could move the rock' was now the big question, but there was a ready answer: Joe Grew. Joe and his crew could move anything, and they did. The rock was moved to its new location, which was on the opposite side of the road from this present location. In 1965 when Highway 56 was again remade, Supervisor George Swift organized the project and the rock was moved to its present location. The land was given to the Town of Colton by Mrs. Hilda Swift, and through her generosity, the area was enlarged to the present day park with the 1976 Bicentennial Time Capsule buried beneath the mammoth stone. For many who pass by here, the Adirondacks still exert their mystical appeal. Vacationers who return to these hills, year after year, probably have their own "Sunday Rock"; a river crossing, a turn in the road that reveals a first glimpse of the mountains, some sign that you have crossed into a place where the calendar can be forgotten; where there is beauty to love and the everlasting hills to savor. The meaning of the rock has not been forgotten. Through the years, people have remembered the legend and all it represented. The invisibly inscribed names of Hollywood, The Jordan, Catamount, The Plains, Joe Indian, Sevey, Huggards, Stark, Jamestown Falls, Moody and Moosehead can still conjure up thoughts of the comfort of camp, venison, fried trout, pancakes, maple syrup and adventure in the big woods. It has been the continued affection of many generations, which has preserved the old landmark and the legend surrounding it. Sunday Rock still separates the woods from the world, and the message from those who preserved it is still clear. The woods are better." 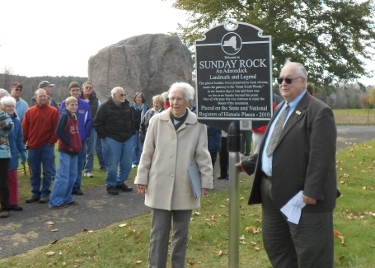 Sunday Rock was placed on the NYS and National Registers of Historic Places in 2009 and in 2011 on the National Registry of Historic Landmarks. It is the only rock in the Registry.